This recipe takes chicken fingers to a whole new level. Made with a crispy almond crust and served with a spicy-sweet dipping sauce, our Almond-Chicken Dippers are sure to become a new family favourite. Cover baking sheet with parchment. Combine coating mix and nuts in shaker bag. Add half the chicken; shake until evenly coated. Place on prepared baking sheet. Repeat with remaining chicken and coating mixture. Bake 15 min. or until chicken is done. Meanwhile, mix barbecue sauce and applesauce until blended. Serve chicken with barbecue sauce mixture. Serve with a crisp green salad tossed with your favourite Kraft Dressing. 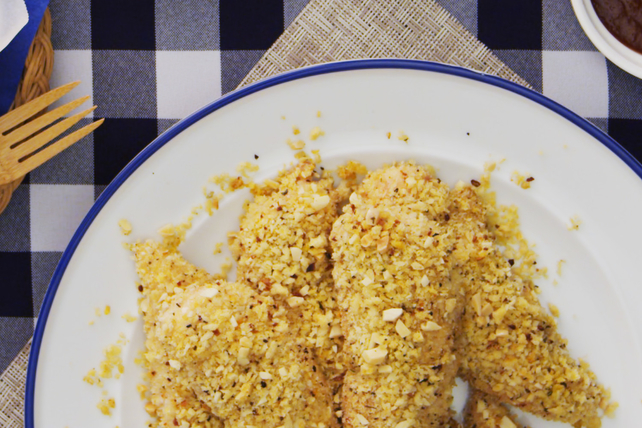 These baked chicken tenders are a smart alternative to takeout that can be made at home.